A few weeks ago, some friends & I stopped into High Street on Market for brunch where the menu is crafted by one of Food & Wine magazine’s Best New Chefs, Eli Kulp. 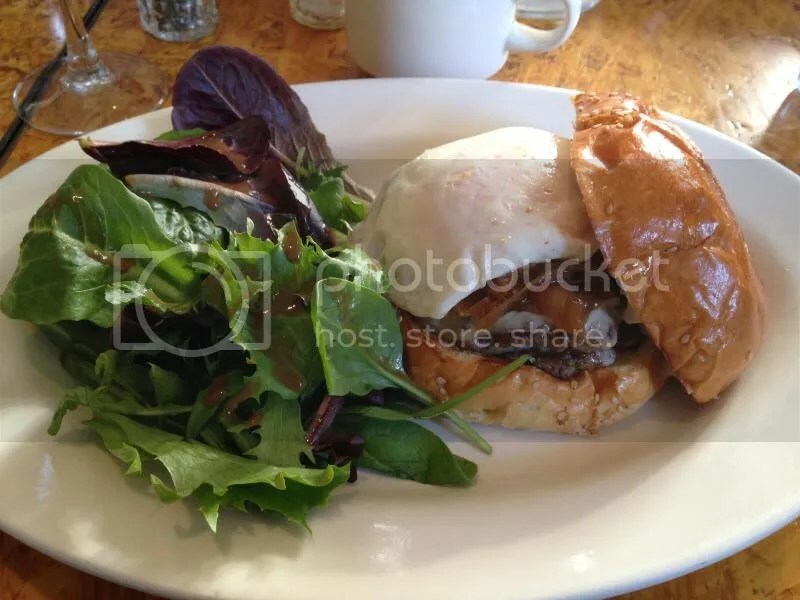 We loved the sandwiches and pastries there so much that we made this month’s brunch stop at a.Kitchen, where Chef Kulp recently took over the menu this past spring. Naturally I was excited to try the burger on the brunch menu: a Creekstone Farms Black Angus patty topped with cave-aged cheddar, mayo and pickles on a house-made sesame bun. The presentation looked amazing. I almost asked for ketchup for the potatoes, but they were so soft and perfectly seasoned, I didn’t even need it. 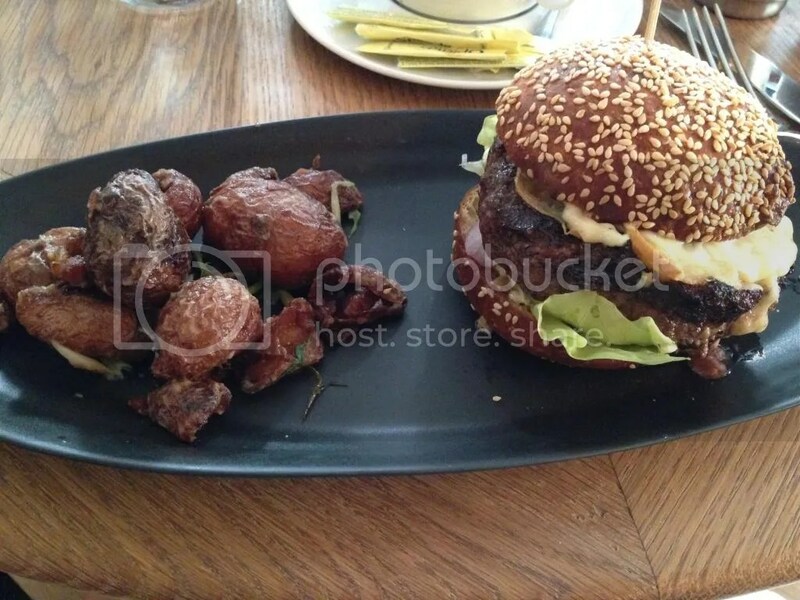 The burger patty was thick and proportional to the bun. My only complaint was that when I picked the burger up, the bottom of the bun was very soggy (luckily, the bottom bun was also pretty thick so it didn’t fall apart). The meat was juicy and flavorful, despite being cooked slightly more medium-well than medium (one of my friends also ordered the burger & got hers prepared medium-rare, and it was plenty red inside). The cave-aged cheddar paired well with the house mayo, giving the burger a good, tangy flavor, and the pickles added some sweetness and crunch. The quality of the meat and freshness of the ingredients definitely made it a solid brunch selection. 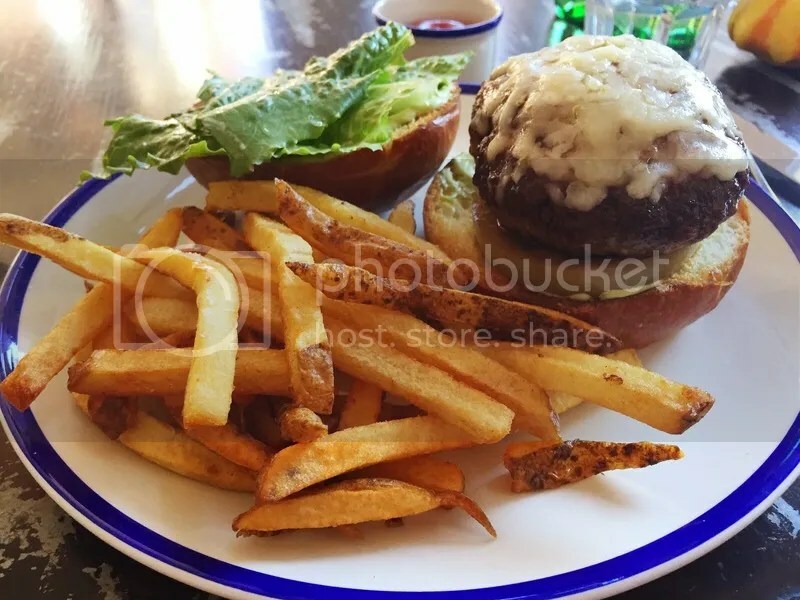 Even though the patty was a pretty hefty size, it didn’t leave me feeling super stuffed or weighed down like some bar burgers tend to do – which means you’ll have plenty of room for some of their delicious, house-baked pastries as well. Chef Kulp just added a more bar-esque version of the burger to the menu next door at a.Bar, so I will definitely have to go back and check that one out, too! 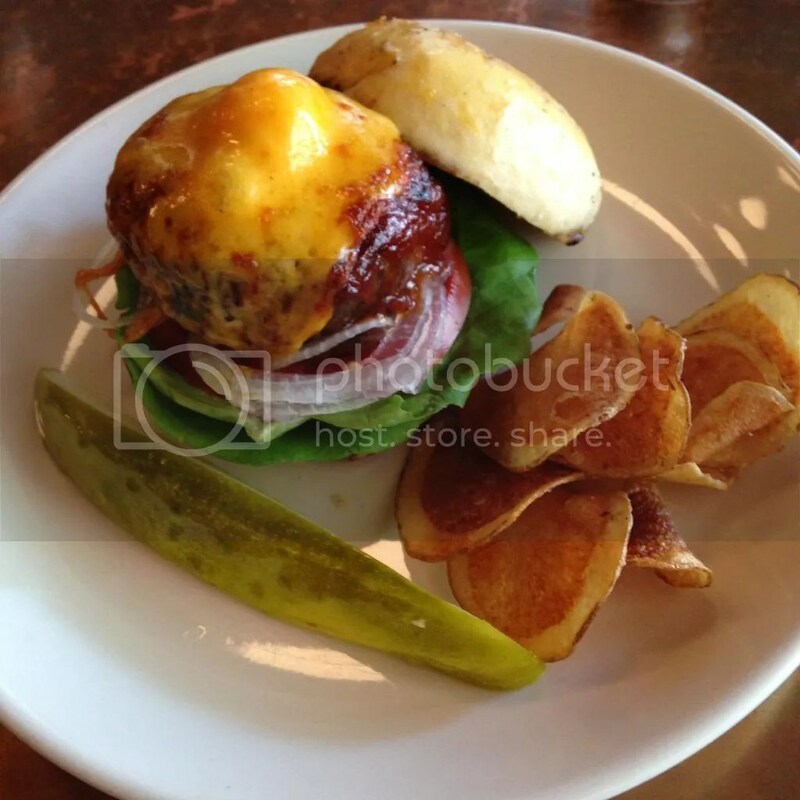 Posted in a.Kitchen, brunch, buns, burger, cheddar, cheese, Creekstone Farms, Eli Kulp, mayo, pickles, seeds. Bookmark the permalink. 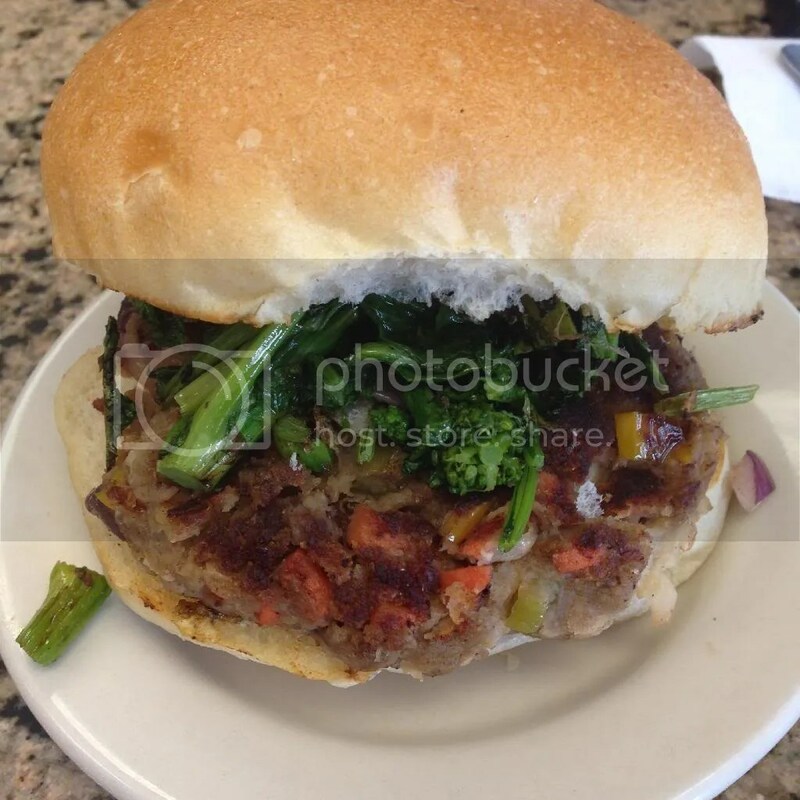 So here it is: my final veggie burger post to wrap up Meatless March. It’s been a long, strange 31 days and appropriately enough, today’s veggie burger comes from Strangelove’s. 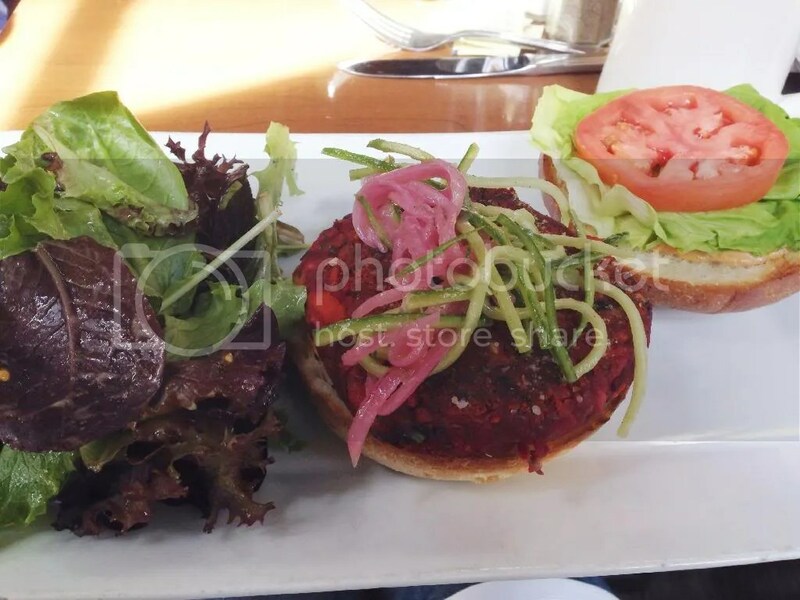 I’ve already had one of their regular burgers before and thoroughly enjoyed it, so I was really interested in trying their veggie burger, which is made with beets & lentils. I understand that beets are not for everyone (they’re gross, they taste like dirt, etc), but beets are another one of those foods I’ve eaten in the past year that I never liked before (oysters being the other) & have learned to love; it’s all about preparation (like the AMAZING beet tartare I had at Zahav)! The veggie burger comes topped with a cucumber slaw & harissa mayo. It’s also super reddish-pink (because of the beets, duh)! Since I was eating brunch with a group, I was worried I was going to wind up with “toddler syndrome” (where whatever your eating winds up all over your face beyond your control) and just have a mouth covered in pinkish-reddish blotches (Thankfully, that’s what napkins are for!). The cucumber slaw added a great crispy texture to balance with the softness of the veggie patty, as well as a little bit of sweetness. The patty was moist and perfectly proportional to the bun, and the mayo gave it just enough of a spicy kick to dull down the “dirt” flavor, but not overpower it. Just a great overall array of flavors; I enjoyed it tremendously. So which of the four veggie burgers I ate this month was my favorite? Honestly, I loved all of them! From the quick, no frills patty at HipCityVeg to the farm to table creation at Kennett, I sampled a pretty wide spectrum of veggie burgers, each with their own unique qualities. And just like snowflakes, no two veggie burgers were alike; each one was a perfect representation of the establishment that created it. I’m glad that I was able to show that you don’t have to just eat at some boring, organic, Portlandia-esque hipster vegan place to get a meal that tastes great (and also that veggie options can still fill you up the same as meat based ones) Hopefully my little meatless experiment inspired some of you to go on your own veggie burger expeditions. We’ll be back to eating meat again next week – and I’m drooling already just thinking about my first bite of a juicy, medium cheeseburger in over a month! Posted in beets, brioche, brunch, buns, cucumber, mayo, slaw, Strangelove's, veggie burgers, veggies. Bookmark the permalink. Nearly two weeks into Meatless March, I’ve been finding myself bombarded with delicious depictions of meat at every turn. I would probably even eat a McDonald’s cheeseburger right now if one were put in front of me, but I’m standing strong! This week, my tremendous will power led me to Grubhouse, a South Philly luncheonette known for its “Best of Philly” award-winning bacon pancakes and tater tots wrapped in bacon and a burger topped with pork roll and scrapple; basically meat plus meat with a side of meat. I decided to throw the staff for a loop and order a veggie burger (They actually had a veggie burger on their menu?, you ask. Yes Virginia, they have veggie burgers in South Philadelphia). While the menu is rather meat-heavy, there’s still a few options for Vegetarians like french toast, waffles, and your requisite breakfast egg dishes. They also offer a $12 prix-fixe weekend brunch menu, which includes dessert, and they’re BYOB. So why wait outside a restaurant for 2 hours on a Sunday morning with the hungover masses? Head on down to Grubhouse and get more bang for your buck instead! Posted in bacon, brunch, buns, Grubhouse, South Philly, veggie burgers, veggies. Bookmark the permalink. I know I’ve had my issues with brunch in the past, but Sunday mornings are quickly becoming my favorite part of the week. I mean, what’s not to love about brunch?! A whole menu full of both sweet and savory foods plus a socially acceptable atmosphere in which to get completely wasted before noon? It’s a beautiful thing! 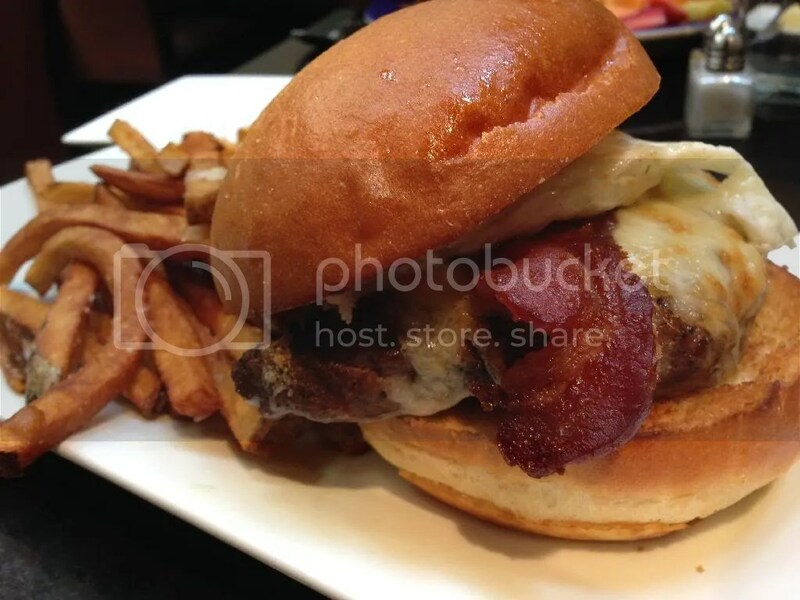 This time, I decided to keep it local and check out Derek’s in Manayunk so I could sample their brunch burger: a 1/2 pound prime sirloin patty topped with a fried egg and bacon (plus the option to add cheese for $1 more; I went with cheddar). Posted in bacon, brioche, brunch, burger, burgers, cheese, Derek's, fried, fried egg, Manayunk, medium-rare, mimosas. Bookmark the permalink.